Am I better off than I was four years ago? If President Obama is reelected, will I be better off in four years than I am today? These questions seem to be at the center of the choice that has been presented to the American electorate to be decided tomorrow. From my perspective, I would have to unequivocally say yes to both. One might assume that I easily came to these answers through the partisan lens of my liberalism. However, I invested in a great deal of contemplation to settle on these answers. I forced myself to look into the core of who I am to properly evaluate the questions. Not because my vote in this election was truly on the table. I concede that President Obama has long since earned my vote. But the reason I forced myself to perform this exercise was to submerge myself in my convictions. I wanted to know that I arrived at my answers to these questions in the place where I am in closest proximity to truth. The core of our beings is a hard place to evaluate political constructions designed to bend our surface level understanding of self through the prism of a presidential election. Nonetheless, I believe in the sacred value of my vote. I refuse to allow for there to be a perception that it can be manipulated by the cynical calculation that my choice is persuadable based on circumstance or that it can be taken for granted based on ideology. And I’m glad that I took the time to evaluate these questions by looking into the core of my being. As an artist, I believe in spending a great deal of time in deep introspection searching for creative inspiration through self-understanding. By submerging these cheap political metrics into the depths of my being by way of the same process through which I extract my artistic creativity, I fortified my conviction that my answers are correct because the questions are wrong. The best way I know how to articulate my conviction of unwavering support for President Obama is by unfolding this conviction through the construct of my artistic journey. Since I derive this conviction from my core and because I spend most of my introspection extracting artistic truth, I feel best able to share it in this manner. Let me provide some context. Four years ago, I had just turned thirty. Four years from now, I will be thirty-eight. Better off? On its surface, it seems that aging is detrimental to creative energy. Being thirty was a wicked cool age for me artistically. Being within earshot of forty, conversely, seems frightfully scary to my artistic sensibilities. Youth is a precious commodity. I’ve come to realize that it is incredibly fleeting. Not having much of it left, I find it intoxicating and I’m beginning to become quite nostalgic about it. However, I am now coming to know that wisdom is also a precious commodity. The problem is that I have this sense that the expending of my youthful energy is what is allowing me to acquire a bit of wisdom. I know that the over exuberance of youthful ambition has plowed a path for me so that wisdom can take root and begin to grow. Therefore, I cannot obtain wisdom without having to pay for it through the depletion of my youth. Today, I find myself at a point in my artistic journey where I’m actively attempting to reconcile the symbiotic relationship between these two commodities. It is turbulent. This is a trying point in my journey to be evaluating my political convictions because my youthful creative energy is waning but the wisdom that is sprouting to replace it has not yet fully developed. As an artist, I am beginning to value the small bit of wisdom that I have acquired between the ages of thirty and thirty-four. I’m more refined as a writer, poet, and lyricist. My conceptual horizons have expanded. I have far greater control over the use of my voice as a vehicle for self-expression. But I understand that the acquisition of this wisdom didn’t come without a cost. The accelerating depletion of my youth has left a temporary artistic void because the seeds of wisdom left in the wake are just that, seeds. While wisdom is slowly beginning to grow into that void, it cannot keep pace with the rate at which I’m burning through my remaining youth. In four years, my youth will probably have nearly dried up completely. I can’t imagine being able to channel my creative energy into a political protest hip hop song with the same tenacity at the age of thirty eight that I could muster at the age of thirty. Eventually, the acquisition of wisdom will overcompensate for the loss of youthful fervor to allow me to be on balance a vastly better artist. But I don’t anticipate that wisdom will finish filling that void for many years to come; perhaps until I am in my fifties. I’ve come to understand that acquiring wisdom is a slow painstaking process. In the meantime, though I recognize that I’m progressing as an artist through the acquisition of wisdom, I’m trying to manage the creative energy deficit. Better off? On balance: yes. The small amount of wisdom I’ve already acquired allows me to see this. However, I know that I’m not as well off as I will be when wisdom finishes filling the void left from the depletion of my youth. Luckily, I have the foresight to manage this transition period. I imagine for many artists, however, that this is the period in their lives when the music stops. When I was thirty, I could walk into the vocal booth in a recording studio and channel my expression fearlessly. I felt creatively invincible. My art is deeply rooted in political expression. At thirty, recording music was my preferred outlet for channeling that expression. I felt so alive and so at home expressing both my idealism for the future and giving unfiltered commentary on my understanding of the present. I was twenty-two when George W. Bush was appointed to the presidency by the United States Supreme Court. From that moment through the entire Bush Administration, my political understanding of the world and my artistic expression were so interlinked that they were practically indistinguishable. My creativity and passion were fueled by a seemingly endless supply of youthful determination. I had this amazing sense of purpose that burned white hot with the hope that my voice could change the world. As an artist, thirty was the crescendo of my youth. That combination of idealism and desire to affect change quite literally culminated in the 2008 Presidential Election. I worked tirelessly to contribute my creative energy to the building of the political movement that was the 2008 Barack Obama campaign. And indeed it was a movement. The jubilation I felt on November 4th, 2008 when Barack Obama was elected as the 44th President of the United States is burned into my permanent being. In a very tangible way, the hope that my artistic voice could change the world manifested itself in being a part of that historic moment. The problem with being thirty, however, is that while I still had an abundance of youth from which to draw creative energy, I hadn’t yet acquired enough wisdom yet to understand the change that I had taken part in. I won’t pretend that I fully understand it now, at thirty-four. But I can say that through the few seeds of wisdom that have begun to spout in my artistic progression between then and now, I’ve realized two things by submerging the “better off” questions into the core of my being. First, I’ve realized something about the nature of political change. I’ve realized that the election of Barack Obama in 2008 was not supposed to be the ending of the present as I understood it a thirty. It was not supposed to be a sea change release from all the injustice I perceived in the world during the Bush Administration and had spent the better part of a decade trying to channel into progress through artistic expression. A historic moment sure, but what I’ve come to realize at thirty-four that I didn’t understand at thirty is that it was not the ending to a movement; it was one small victory in the perpetual struggle towards progress. President Obama came into office and decided not to govern through the youthful energy that built his campaign. To this day, many people believe that this was a mistake. One can argue that he should have governed as the change agent of a movement, but it can’t be argued that the youthful energy infusing the movement wasn’t largely spent on the election. Those resources were depleting because many in the movement understood the election to be in and of itself the change they were fighting for. After the inauguration, the music stopped, or at least paused for a great many participants in Barack Obama’s movement. But the youthful energy that was spent during the election had plowed a path for wisdom to take root and begin to grow. President Obama has governed with that wisdom and devoted his first term to investing in the true nature of change; engaging in the perpetual struggle towards progress. Sure, we are perhaps still currently experiencing a change deficit where the wisdom he has governed with has not yet filled the void of the youthful energy that was spent to get him elected. But the wisdom of President Obama’s policies has undoubtedly built a solid foundation for the movement to continue to march forward upon in the perpetual struggle for progress. 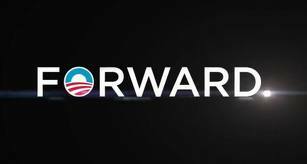 The forces against progress did not wave the white flag when Barack Obama was elected as our president. It was naïve of me at thirty to abstractly view the election as the change I was fighting for and remains naïve for many others to somehow believe that the forces against progress could be defeated with one election. These forces regrouped and refocused their efforts at putting a halt to this progress. Part of the equation for achieving this halt has been to convince enough of us that progress hasn’t happened. That Barack Obama has failed to enact change. Whether painting him as a left-wing socialist or painting him as a corporatist democrat. Whether trying to convince us to vote for Governor Romney because President Obama’s economic policies have failed or trying to convince us to vote for a third party candidate or stay home because President Obama’s foreign policies are as destructive as the policies of President Bush. These forces want to halt progress and they have extremely sophisticated mechanisms for presenting their versions of reality. From both extremes, they are either not interested in or incapable of coming to terms with the true nature of change. We must evaluate these “better off” questions at our core to maximize our proximity to truth. Having earnestly attempted this, I am convinced that President Obama has delivered on his promise of change and reelecting him tomorrow is the only chance to have another small victory in the perpetual struggle towards progress result from this election. The forces against progress are banking upon convincing us that our idealism and the youthful exuberance that built this movement has been a waste by putting our hope in this leader. I’ve realized that life is too short to allow progress to halt tomorrow. In four years, I’ll be thirty-eight; within earshot of forty. My artistic creativity will hopefully be feeding almost entirely then off of wisdom instead of youthful energy. I don’t want to have to be devoting that creativity to rebuilding a movement from the shambles of an abrupt halt to progress. We cannot go backwards at this juncture. We must move forward. The void in youthful enthusiasm in this year’s campaign must be filled by the seeds of wisdom. The electorate must have the wisdom to overcompensate for the lack of youthful energy. We cannot allow the music to stop. The second thing I’ve realized by submerging the “better off” questions into the core of my being and filtering them through the small amount of artistic wisdom I’ve acquired over the last four years is that the questions are wrong. I’ve fortified my conviction that my answers are correct because I’ve come to realize that the questions are wrong. The questions should not be: Am I better off now than I was four years ago? If President Obama is reelected, will I be better off in four years than I am today? The questions should be: Are we better off now than we were four years ago? If President Obama is reelected, will we be better off in four years than we are today? I’ve come to understand that making an artistic contribution to a movement is not about making me as the artist better off; it’s about making the collective better off. It’s about contributing a little piece of inspirational fuel to a collective struggle. I’ve also realized that the youthful determination fueling artistic inspiration for this movement doesn’t have to come from my art. In the last four years, I’ve discovered an inspirational number of artists younger than me with an abundance of youthful creative energy. That fuel for a movement doesn’t deplete for the collective in the same way that it depletes for individual artists. I can settle into the process of discovering wisdom and using it as the fuel for my art, and confidently leave the youthful determination to the next generation.